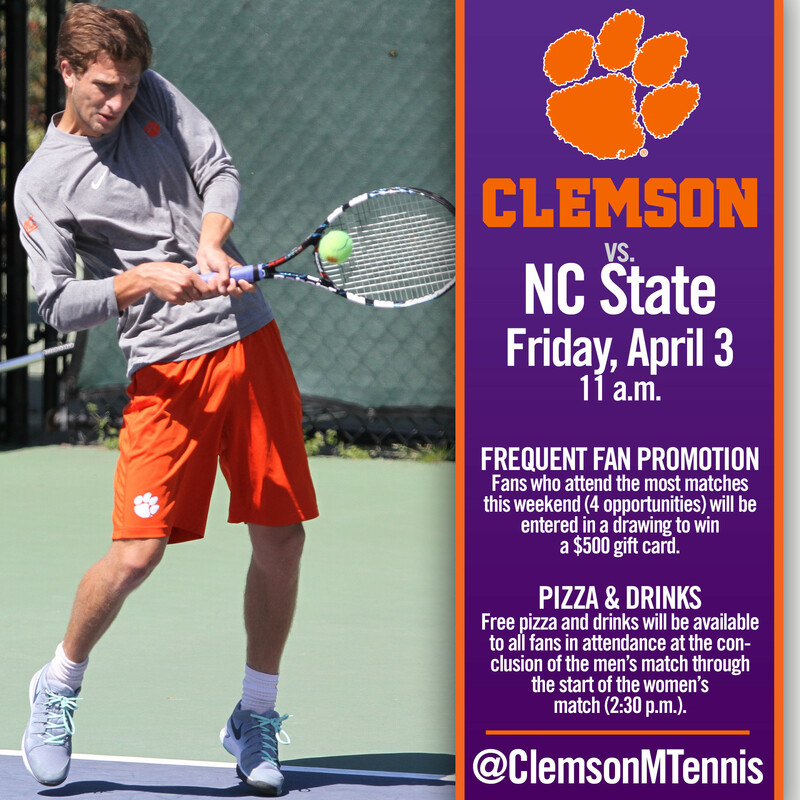 CLEMSON, S.C. – The Clemson men’s tennis team hosts NC State and No. 12 Wake Forest at the Hoke Sloan Tennis Center this weekend. First serve between the Tigers and the Wolfpack is set for 11 a.m. on Friday, April 3. Clemson takes on the Demon Deacons on Sunday, April 5 at 1 p.m. Live scoring is available on ClemsonTigers.com and updates are also available on Twitter, @ClemsonMTennis, for both matches. Admission is free to all regular season home tennis matches. The Tigers stand at 10-11 overall and 1-6 in ACC play on the season and are coming off 2-5 losses to No. 4 Duke and No. 23 Louisville. Clemson’s last three matches, and five out of its last six, have come against opponents ranked 27th or higher in the nation. Last Friday, Clemson’s top doubles duo of senior captains Alejandro Augusto and Hunter Harrington upset the Blue Devils’ 12th-ranked doubles team in a tiebreak. Luke Johnson has also played well of late, winning seven of his last eight singles matches. The junior has a 12-7 record in dual matches and a 5-2 mark in ACC play. Scouting NC StateThe Wolfpack are 11-8 overall and 1-5 in ACC play, and are coming off of a 4-3 upset over No. 12 Wake Forest in Raleigh last weekend. The match over the Demon Deacons was NC State’s sixth straight versus top 30 opponents. The Wolfpack are ranked 34th in the ITA poll released earlier this week. NC State’s doubles duo of Ian Dempster and Robbie Mudge is currently ranked 16th nationally, while Mudge is 60th in singles and Austin Powell is 85th. Beck Bond, who plays primarily at No. 3 and 4 singles for NC State, has an 11-5 record in dual matches and a 5-1 mark in the ACC, and has won four straight contests entering Friday’s match. Clemson has a 52-12 all-time record in the series with NC State, including a 25-3 ledger in matches played between the two teams in Tigertown. Last season, the #22 Tigers earned a hard-fought 4-3 win over #43 NC State in Raleigh on March 29. Clemson won the doubles point in the contest, and Harrington, Augusto and Austin Ansari posted wins at No. 1, No. 3 and No. 4 singles, respectively. Scouting No. 12 Wake ForestWake Forest boasts an overall record of 13-6 this season, along with a 3-3 record in ACC play. The Demon Deacons are 5-2 in their last seven matches. The two losses were both by a 4-3 margin and to ranked opponents in Duke and NC State. Wake Forest travels to Georgia Tech on Friday before heading to Clemson on Sunday. The Demon Deacons’ doubles duo of Skander Mansouri and Christian Seraphim ranked 10th in the nation, while three Wake Forest players are listed in the current ITA singles poll – Romaine Bogaerts (8), Noah Rubin (27) and Jonathan Ho (80). Clemson leads the all-time series with Wake Forest 43-30, and the Tigers are 22-8 at home all-time against the Demon Deacons. The two teams met earlier this season at the ITA Kickoff event hosted by Duke on Jan. 24, 2015. Clemson won the doubles point, as Augusto and Harrington defeated Mansouri and Seraphim at No. 1 and Ansari and Johnson were victories at No. 3. However, Wake Forest won singles matches on courts one, two, four and five to claim the 4-1 victory in the match.